This winter, my daughter and daughter-in-law introduced me to Japanese sweet potatoes, which are actually off-white and less sweet than regular orange-colored sweet potatoes, but sweeter than white potatoes. They taste almost like a cross between regular sweet potatoes and white potatoes. The phytonutrients associated with different colors in sweet potato do have different health properties. Besides that, however, sweet potato strains have a very similar nutritional profile. Rich in vitamins, minerals, and phytonutrients, sweet potato has been named the ‘healthiest of all vegetables’ by The Center for Science in the Public Interest [R]. I combined 1/2 Japanese sweet potato with 1/2 Jewel sweet potato and one-half cauliflower, the latest vegetable at center stage. Since this is a Cooking with the Strings of Your Apron recipe, the amounts are fluid, as are the herbs. Utensils: Soup pot or other large pot, cutting board and knife, food processor/ blender. Scrub sweet potatoes and bake at 350 degrees for about 40 minutes, or peel the potatoes and cut into smaller pieces to cook in water or stock. If cooking potatoes in a large pot, instead of baking, add 1/2 cauliflower, washed and cut into smaller pieces. When cauliflower and potatoes are tender (if baked, peel after cooling) and cool enough to handle, place in food processor, a few pieces at a time, and use the cooking water to blend to desired consistency. Start with 1 cup of liquid and add as needed. Place back in the large pot, removing any extra stock in a jar for another dish or to add to the soup if it thickens overnight. 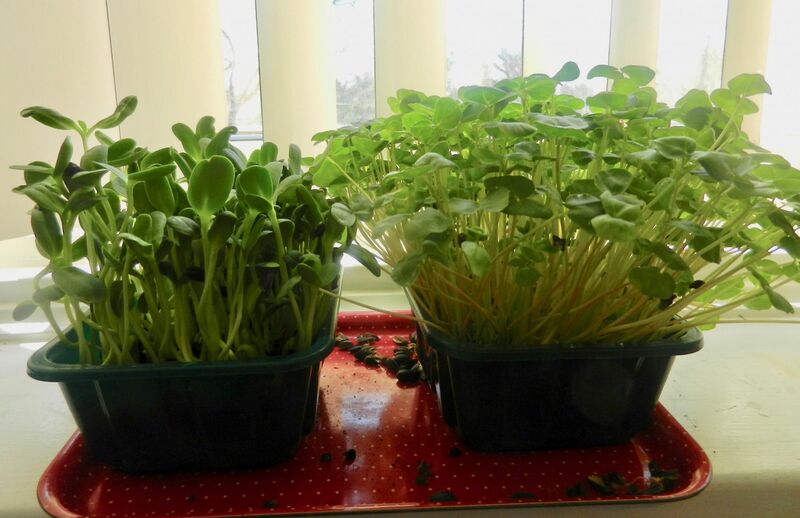 Add spices to taste, heat and serve, garnished with sprouts, if you wish. 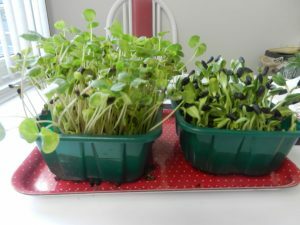 * I used pea shoots that I purchased at Mom’s Organic, but you can also use sunflower greens or alfalfa sprouts or clover sprouts. Both available in health food stores like Mom’s Organic. 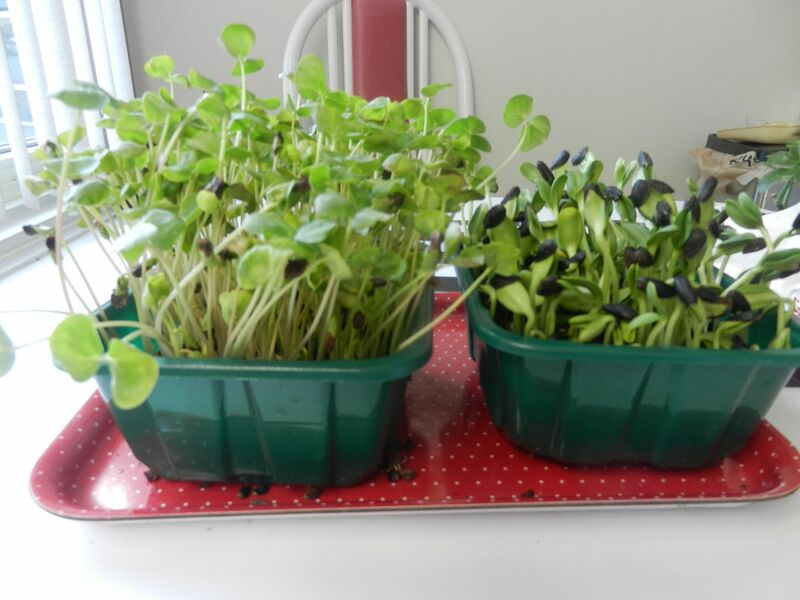 More on sprouting in a later posting this month. 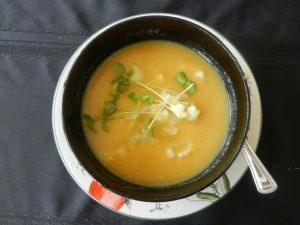 Note: I saved some chunks of cauliflower before blending and added them to the soup for a little texture. Also, since this is food low on the food chain, I consider it an Earth Day, Every Day recipe. You are currently browsing the archives for the Earth Day, Every Day category.